We are a safe, caring, Christian learning environment for preschoolers from 6 weeks to 4 years-old. 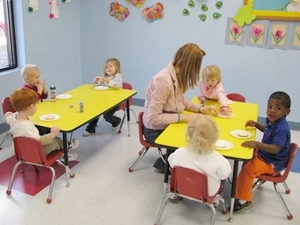 The ELC is a full time (7:00am-6:00pm) preschool with spot-sharing available. We also offer a Before/After Grade School program and a Full Time Summer CAMP for kindergarten through 5th grade students of Margaret Elementary School. For more information, call the ELC office at (205) 629-0460.